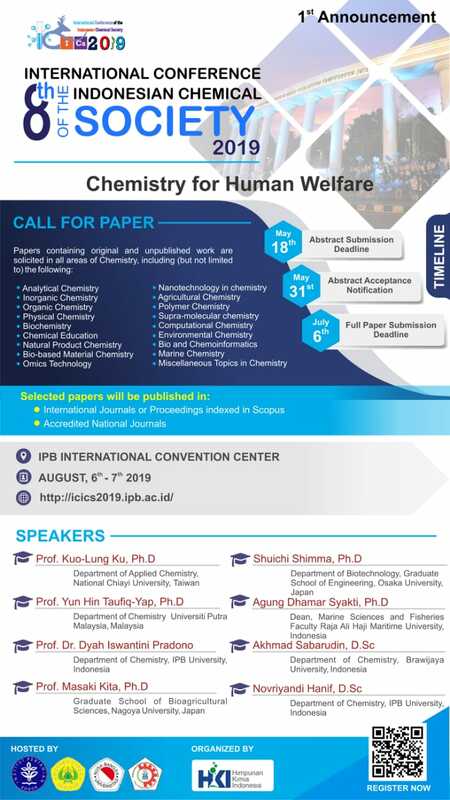 International Conference of the Indonesian Chemical Society (ICICS) is an annual conference of the HKI (Himpunan Kimia Indonesia) that covers all fields in chemistry. The 8th ICICS will be held in IPB International Convention Center, Bogor, Indonesia on August, 6th-7th 2019. We are pleased to invite you to join the 8th ICICS 2019. This year, it will bring Chemistry for Human Welfare as the theme of the conference. Berikut kami sampaikan informasi bahwa kami akan membuka “Workshop HPLC Untuk Metode Kontrol Kualitas Tumbuhan Obat 2018”. 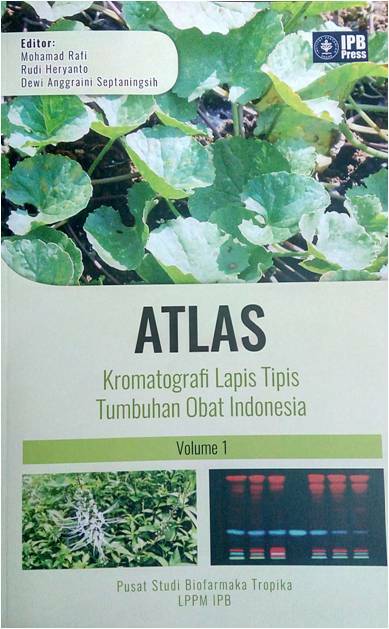 Kegiatan ini diadakan oleh Pusat Studi Biofarmaka Tropika (Trop BRC) LPPM-IPB pada 05-06 September 2018 di Trop BRC, Kampus IPB Taman Kencana, Jl. Taman Kencana No. 3, Bogor. Workshop akan kami buka bila minimal ada 12 peserta. Abstract template can be downloaded from here. 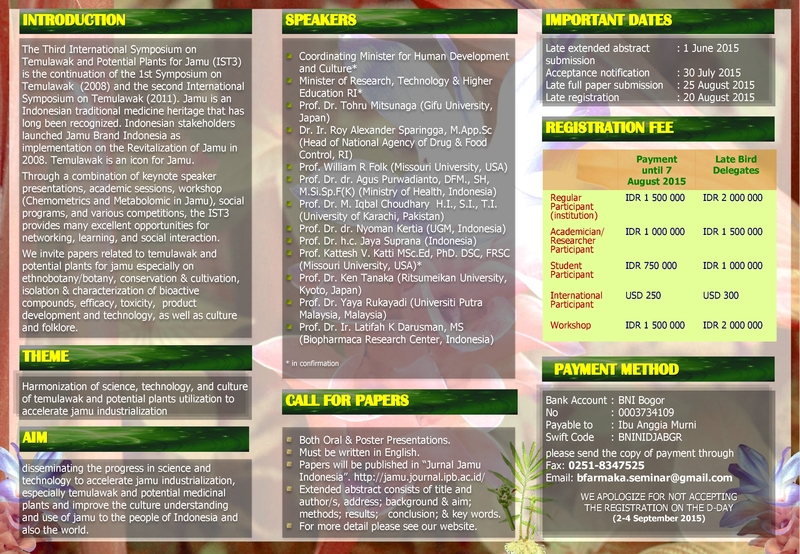 Click Overview and read this slide to know about the detail information and the scope of this conference. It is our pleasure to welcome you to the International Symposium on Natural Medicines (ISNM) 2017. 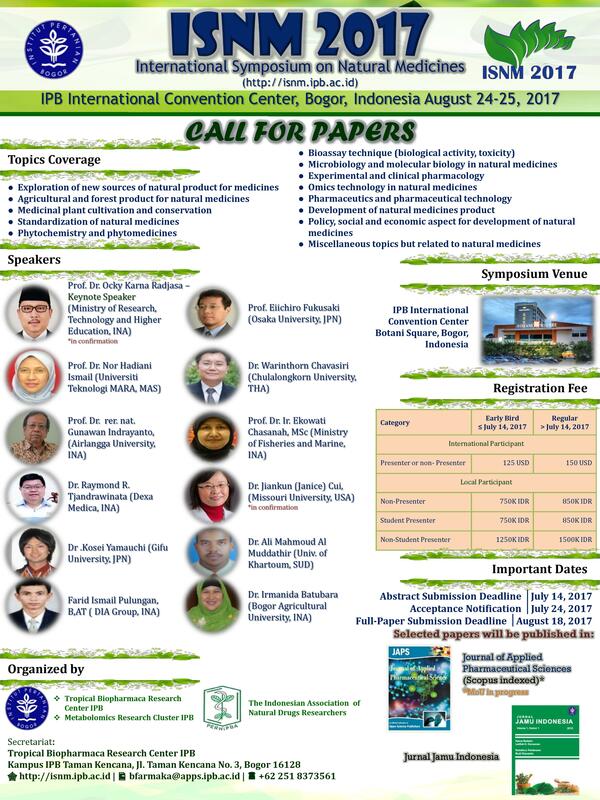 ISNM2017 will be held in August 24-25, 2017 at IPB International Convention Center (IPB-ICC) in Bogor, Indonesia. 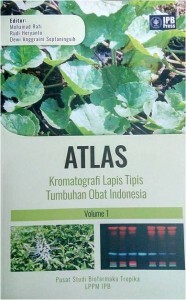 The symposium venue is located next to the Bogor Botanical Garden. This year’s theme is Sustainable Use of Natural Products for Human’s Health and Welfare. Student presenters are eligible for the student discount rate, please see the Registration for details. Please see the Call for Papers for details. * The MOU with JAPS is in progress. 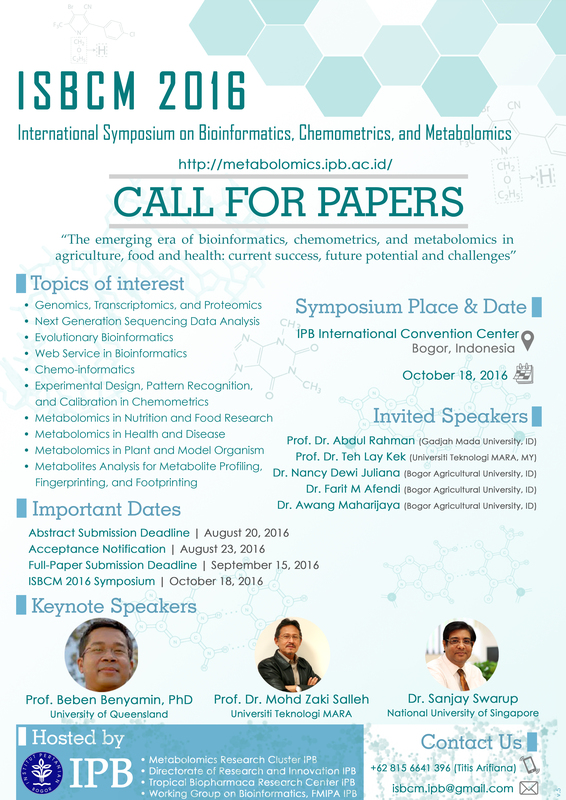 We would like to invite you to join the first of the International Symposium on Bioinformatics, Chemometrics and Metabolomics (ISBCM) 2016. The event will be held on October 18, 2016 at IPB International Convention Center in Bogor, Indonesia. ISBCM 2016 will bring together researchers working on Bioinformatics, Chemometrics and Metabolomics (ISBCM), which are vibrant multidisciplined fields with positive trend in this decade. Metabolomics is an “advanced research” approach used to improve our understanding of metabolic systems and biochemistry compositions of plants and animals. Chemometrics is a science of how to extract information from chemical systems that can be applied to solve both descriptive and predictive problems in experimental life sciences. Bioinformatics refers to conceptualizing biology in terms of macro molecule (from points of views of chemistry and physics), and then applying computational approaches from applied mathematics, computer science and statistics in order to understand and manage molecular information in its macro scale. In view of your important contributions, we would like to invite you to participate to the conference. 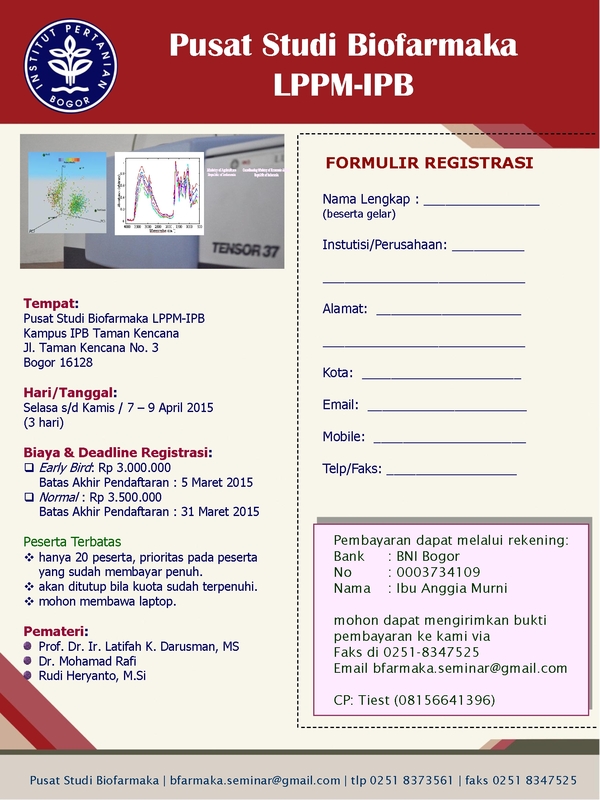 Here we send you ISBCM 2016 poster. 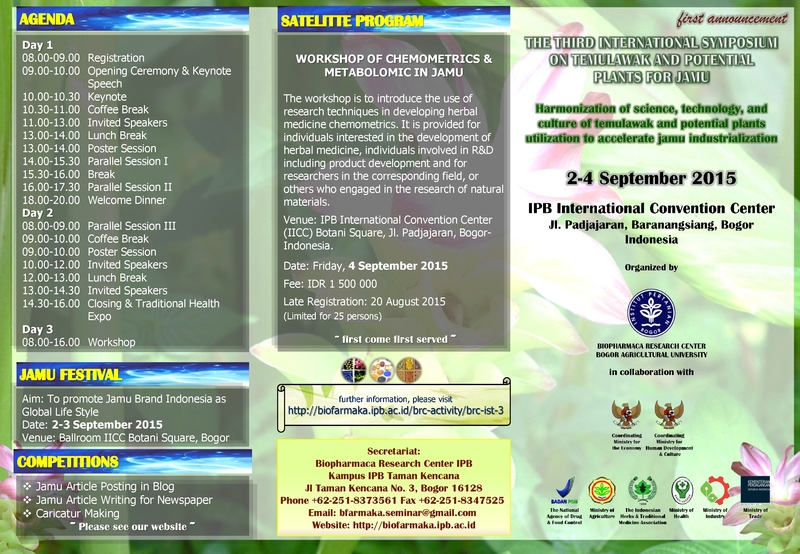 For more detail information, please visit our website http://metabolomics.ipb.ac.id/. Thank you for your very kind attention. We’d appreciated if you could help us to spread this information to your colleagues whom are interested in bioinformatics, chemometrics and metabolomics. We are looking forward to seeing you for the conference at Bogor and we believe that your contribution will make the symposium fruitful and benefit for all of us. The success of ISBCM 2016 will be ensured with your kind contribution. Berikut kami sampaikan bahwa kami akan membuka Pelatihan Pengembangan Metode Fingerprint Analysis Berbasis HPLC Batch II apabila ada minimal 10 peserta. Kegiatan ini diadakan oleh Pusat Studi Biofarmaka LPPM-IPB pada 17-18 Mei 2016 di Kampus IPB Taman Kencana. 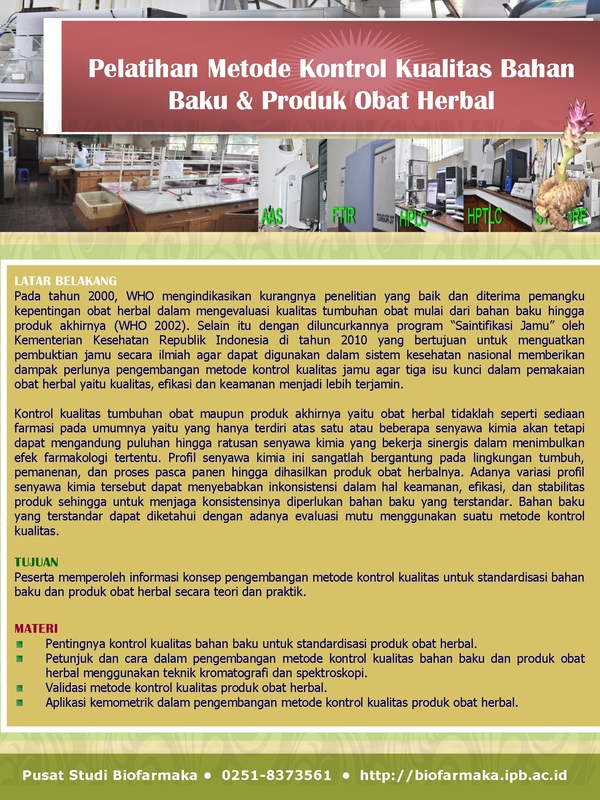 Berikut kami sampaikan informasi mengenai Pelatihan Metode Kontrol Kualitas Bahan Baku dan Produk Obat Herbal yang diadakan Pusat Studi Biofarmaka LPPM-IPB, dari tanggal 7 – 9 April 2015.